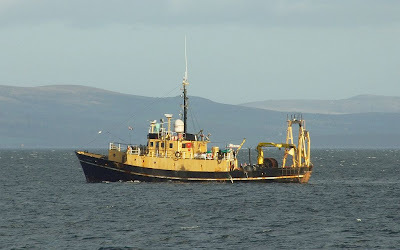 Despite wearing the same colour scheme as some naval support craft, CLUPEA is operated by the Scottish Government's Fisheries Research Services. This little ship was built by the Aberdeen shipyard of Hall, Russell and Co in 1968, and given an extensive refit twenty years later. She is 32.10 metres long, and 225 gross tons. Normally based at Fraserburgh, CLUPEA is soon to be replaced by a new state-of-the-art vessel being built at Macduff. Named ALBA NA MARA, she was launched on 31 August and is due to be around the end of the year. Fuller details of the new vessel, together with several images, can be seen here.